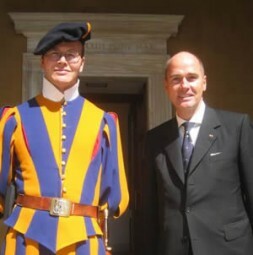 Dr. Hubertus Hoffmann, Founder and President of the World Security Network Foundation visiting the Vatican promoting tolerance between Islam and Christianity: "Both in the West as well as in the Muslim world, the central aspect of Islam as a progressive and tolerant religion has come to be forgotten. The Islamic nations need an “Islamic Renaissance”, a return to a true, original teaching of a tolerant and cosmopolitan religion as well as a constitutional safeguarding of rights and freedom for its citizens, encompassing the protection of other religions and value systems." Both in the West as well as in the Muslim world, the central aspect of Islam as a progressive and tolerant religion has come to be forgotten. Radical, self-styled but false prophets have even usurped and falsified the original teachings of the Prophet Mohammed, transforming them into their very opposite- an intolerant doctrine preaching death to Christians and Jews. In this respect, they have essentially betrayed the Prophet Mohammed, just as centuries before those who burned witches at the stake and carried out the Inquisition perverted the Christian teachings of charity and reconciliation. Hundreds of thousands of men and women were killed in the name of Jesus, whose teachings expected exactly the opposite. In 628 C.E. 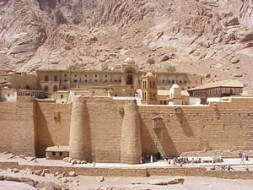 Prophet Muhammad granted a Charter of Privileges to the monks of St. Catherine Monastery in Mt. Sinai. Should anyone take any of these, he would spoil God’s covenant and disobey His Prophet. Verily, they are my allies and have my secure charter against all that they hate. "In 628 C.E. Prophet Muhammad granted a Charter of Privileges to the monks of St. Catherine Monastery in Mt. Sinai." This charter of privileges has been honored and faithfully applied by Muslims throughout the centuries in all lands they ruled. At the beginning of Islam and at its zenith as an international power in the early Middle Ages, the teachings of Allah promoted tolerance with respect to other religions, cultures, and races, whereas the Christian fanatics—the Crusaders and later those who carried out the Inquisition—treated those of other religions with intolerance, going against the doctrine of charity in a perversion of the Christian faith. Today, it is the Islamic fanatics from the now weak Islamic countries who are, as opposed to the original teachings of their Prophet, the ones who are intolerant and it is the world-dominating Christians who are notably tolerant. The Islamic nations need an “Islamic Renaissance”, a return to a true, original teaching of a tolerant and cosmopolitan religion—the obvious opposing model to that put forth by a minority of fanatic radicals preaching their own style of Islamic Inquisition and Crusade against those with differing beliefs—as well as a constitutional safeguarding of rights and freedom for its citizens, encompassing the protection of other religions and value systems.